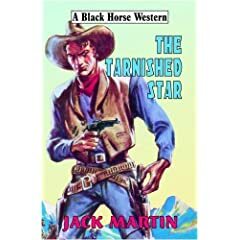 This entry was posted in Marketing, Social networking and tagged black horse, gary dobbs, jack martin, robert hale, tarnished star, western by Roy Bayfield. Bookmark the permalink. Besides being a friend of Gary’s, I’m also a marketing writer for a software company that caters to professional services firms. Although our software has a large market share and is considered very innovative, the marketing approach up until recently has been a decidely traditional one ( using hard copy materials and for the most part keeping the Web site static). Thankfully that is now changing. I found your article fascinating and will be sharing it with my managment. I’d like to add that The Tarnished Star does deserve all the attention it is getting – it’s traditional, yes, but also deftly written and a page turner. My publisher, too, believes in the power of the Internet. Dan Snow, with Unlimited Publishing, makes a strong case for online marketing. Roy’s comments add substance to the ideas of Dan and make a compelling argument. Obviously Gary’s success is the proof. It is obvious that getting the word out is critical to success. My own work has been received with really great comments from readers, but it is mostly people who know me. Even with an Internet presence, it’s still slow because of both time and energy required after a full day of Internet and writing and research. Thanks for the article … priceless! I’m hoping it’ll work for me. I don’t do the Facebook stuff, and I probably stood, but I do extensive blogging and a fair amount of forum work. I just can’t afford the time to do more, though, and that’s likely to be a problem for me. Anywhere you can get your book in front of people is great for exposure. Social marketing takes time, but in the end the benefits outweigh the time spent. Gary does this very well. I’m glad to see that people are noticing his books. Roy, I hope this won’t look like I’m getting into a habit of “pulling you up” ! It isn’t meant that way. The quote about Gary’s thousand pre-order sales actually comes from the current online Black Horse Extra, not the book’s publisher, Robert Hale Ltd. Hale seldom make any public comment whatsoever about their westerns, and this is partly why we have the BH Extra, which has its home at a URL Hale flatly refused to register themselves several times — http://www.blackhorsewesterns.com All this, of course, adds further weight to the message you give us in your post. Gary is great at marketing, but also, Gary’s westerns are excellent. He is promoting a good product. I agree, but in more ways than one. My current promo (same publisher as Gary) is leading me (on a smaller scale) into the social media world. And what a wonderful experience that can be. Taking a ‘unique selling point’ about my forthcoming book, namely a pair of Newfoundlands dogs, I posted a piece about the breed on my blog, including one article about ‘Sergeant’ Gander, the mascot of the Canadian Royal Rifles – a brave canine that was awarded the dog equivalent of the Victoria Cross for its gallant service during the Battle of Lye Mun on Hong Kong Island in December 1941. The information for my article, I sourced from the internet. Yesterday I received an email from a gentleman in Canada whose father served with the Royal Rifles at Lye Mun and knew Gander personally. He described the Newfoundland to me – its history, its behaviour, and detailed its exploits in that battle and the events which led to its death. By the time I had finished reading, I had tears in my eyes. Social marketing is rewarding in book sales, but sometimes the returns can be far more heart-warming. Margaret is right – a community of like minded friends is a wonderful thing. Margaret Muir, like Gary, deserves every success with her book, THE CONDOR’S FEATHER. I understand Marg sent out more than 200 emails, using three different mailboxes, using different subject headings, and spreading the postings over a couple of days. If the “payment” for all this was money alone, Marg reckons she would be lucky to be earning 10 cents an hour! But, as she tells us here, there are fortunately other rewards. Sadly, many writers do not possess Gary’s and Marg’s enviable energy to go along with their enthusiasm for their craft. Gary once told me he gets by on four hours sleep a night! I also know — and have known over the space of more than 40 years — many excellent writers who have no publicist skills, nor want to cultivate them. They want to be WRITERS. I’ve met several of this kind, online, through the work I do on the quarterly Black Horse Extra. Strangely, in a world where specialization has become the norm, the publishing industry seems to have come to expect its authors to make a large contribution to the marketing of books. In turn, that takes away time that might be spent on their “real” job of writing. Great to get so many commentson this post, here and elsewhere. Good points made about the internet as community – I think the divide between readers and writers has broken down somewhat with these new opportinities to communicate and create. This must be specially valuable in a genre such as the western, which doesn’t (correct me if I’m wrong) benefit from publisher-funded signing tours, or fan-organised events similar to science fiction conventions. I can empathise with the ‘excellent writers who have no publicist skills, nor want to cultivate them’ – there is no moral imperative for people to become part-time publicists alongside everything else they have to do. However I feel in many fioelds, including my own, it is becoming a pragmatic necessity. ‘Dobbsian marketing’ – I love it. Gary, you have arrived – you’ll be in a dictionary sometime soon! A very interesting and timely article. Writers write – so I guess we’ll have to write our advertising spiel as well. I’m surprised that more effort hasn’t been put into promoting the western connection by approaching the many Country & Western and Line-Dancing groups – not on a par with Sci-fi conventions but worth a shot. Interesting idea about c&w. I’ve been to some writing-oriented sf conventions (as opposed to the media ones with actors and costumes) and they’re great – writers interacting with fans, loads of books getting sold, readings, new writers getting better known, beer, and brilliant atmosphere. It would be fantastic for something like that to happen on a western theme.